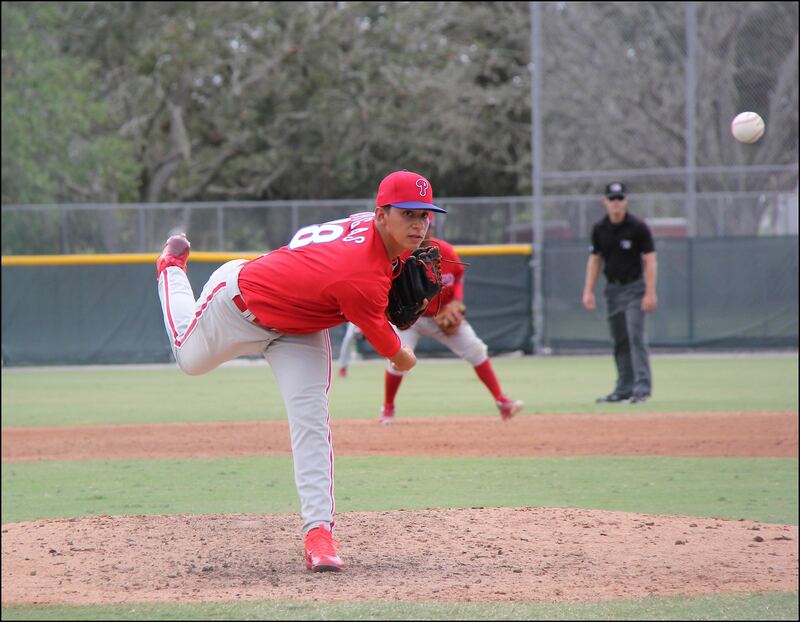 The Phillies concluded their 2017 Instructs program last week. They continued with PFPs, infield and outfield drills, and batting in the morning, and played games in the afternoons. 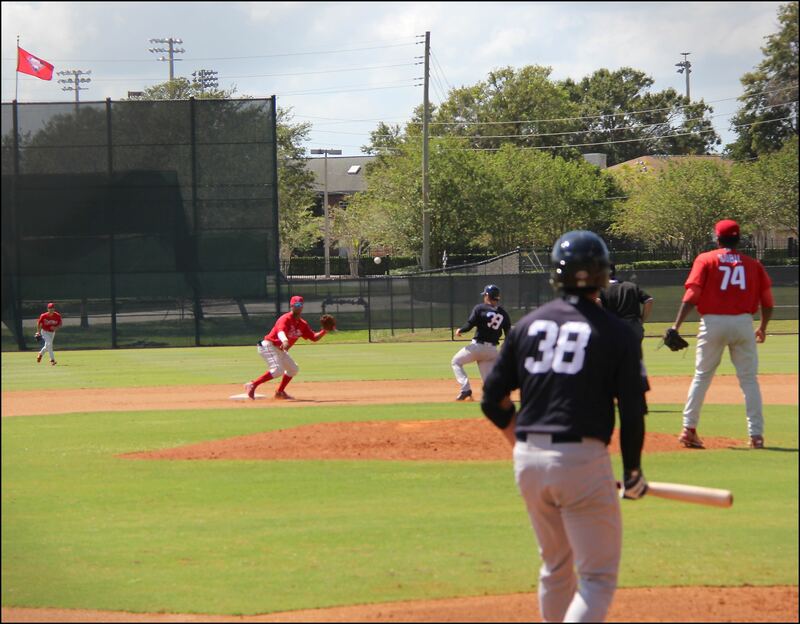 They began their final week with a game against the Braves at the Complex on Monday, then hosted the Yankees on Tuesday. Wednesday they played a truncated intrasquad game. 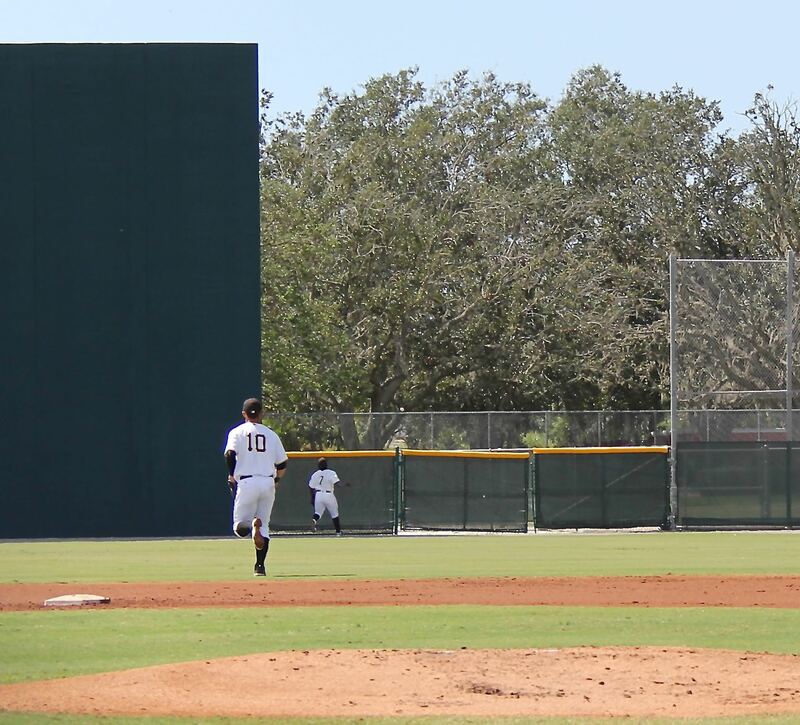 And, Thursday they played their final game on the road against the Pirates in Bradenton. They broke camp Friday morning. Most players were at the airport by noon. Mark Wylie and I covered all the games last week. Mark provided me with an account of the Pirates game and most of the photos below. Once again, due to Mark’s photos and my video (and a couple of pictures of my own), this final Instructs article may run a little long. and another fly ball to right. Sanchez doesn’t appear to be throwing as violently as I remember. He still has his upper 90s velocity on his fastball. 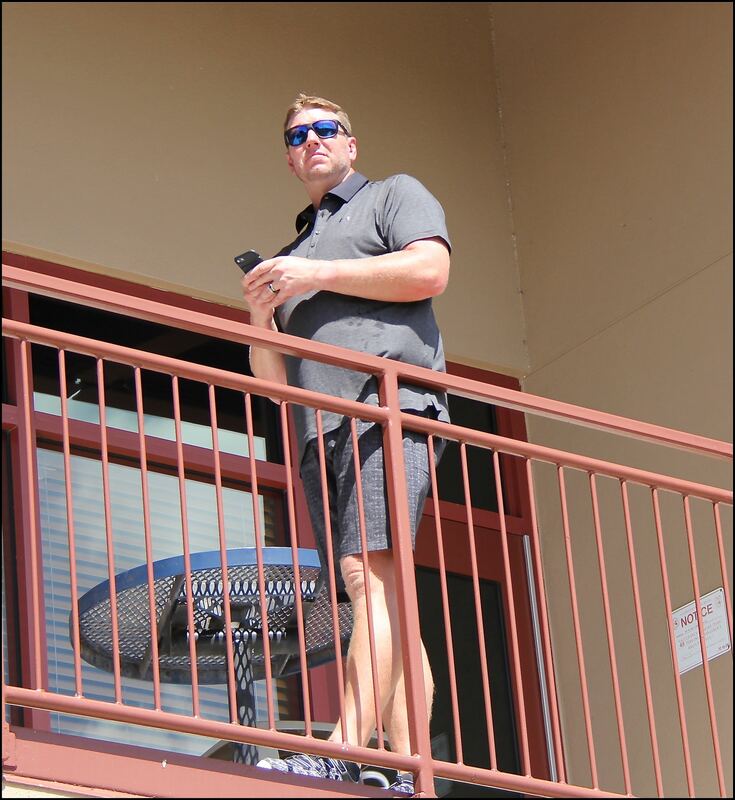 It looked like he was working on his off speed pitches. 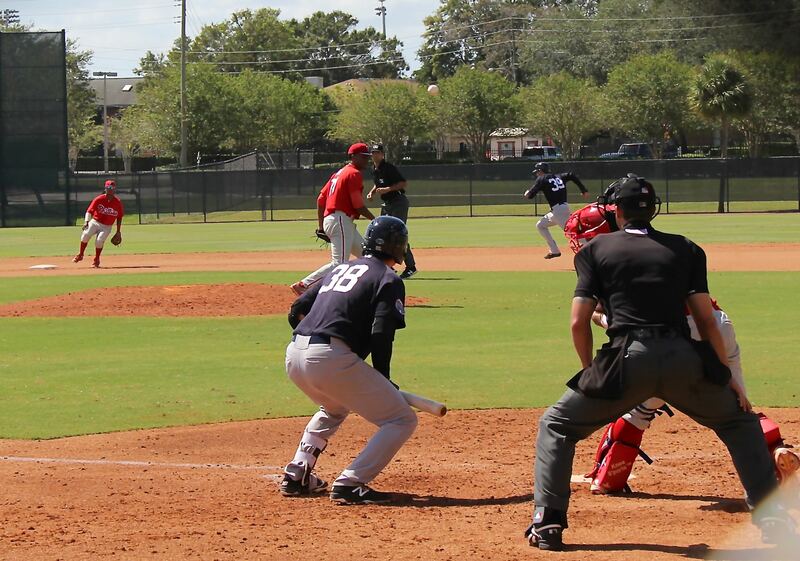 I noticed that he was working the corners, low and away against batters from either side of the plate. He pitched two scoreless innings and struck out one batter. 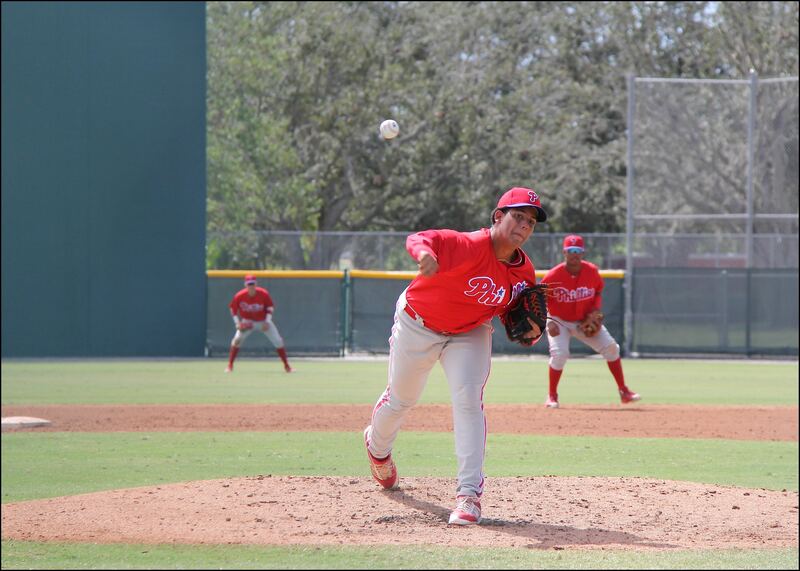 Eighteen year old Leonel Aponte pitched a scoreless third. Kyle Young followed Aponte and pitched two innings. He struck out the first batter he faced, two total (I think), and gave up an unearned run. Ethan Lindow, another 18-year old, pitched the next two innings, and struck out 5 of the 6 batters he faced. Jakob Hernandez pitched the eighth and ninith innings. He starts here with the first of his four strike outs. The second batter tried to bunt his way on base and failed. Watch how quickly Hernandez gets off the mound. Hernandez gets the third our on a fly ball. Hernandez went on to strike out the side in the eighth inning. A still photo of Jake Hernandez coming over the top. 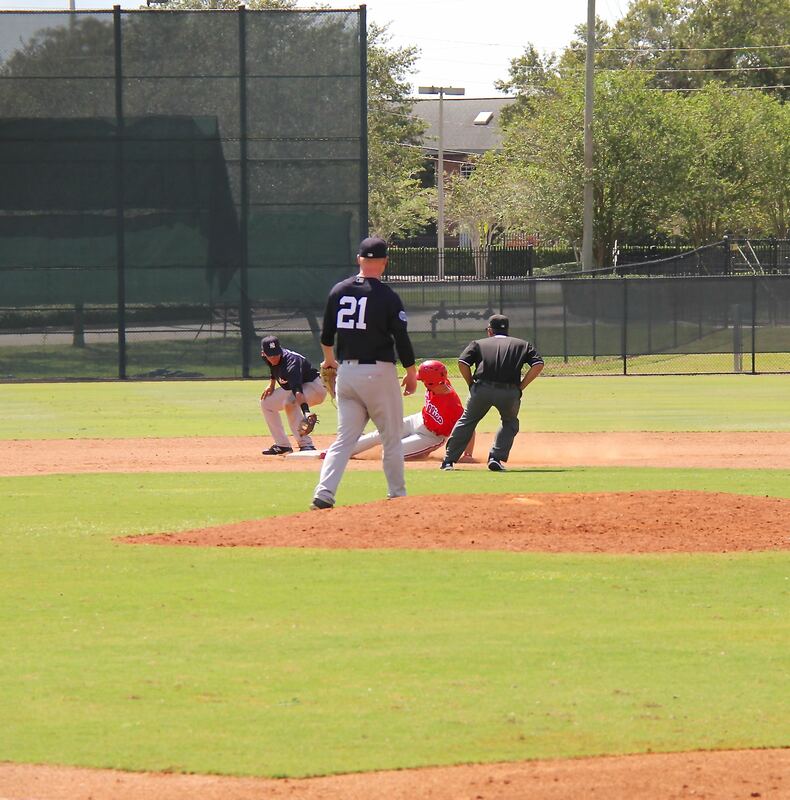 He was working on a change up during Instructs. 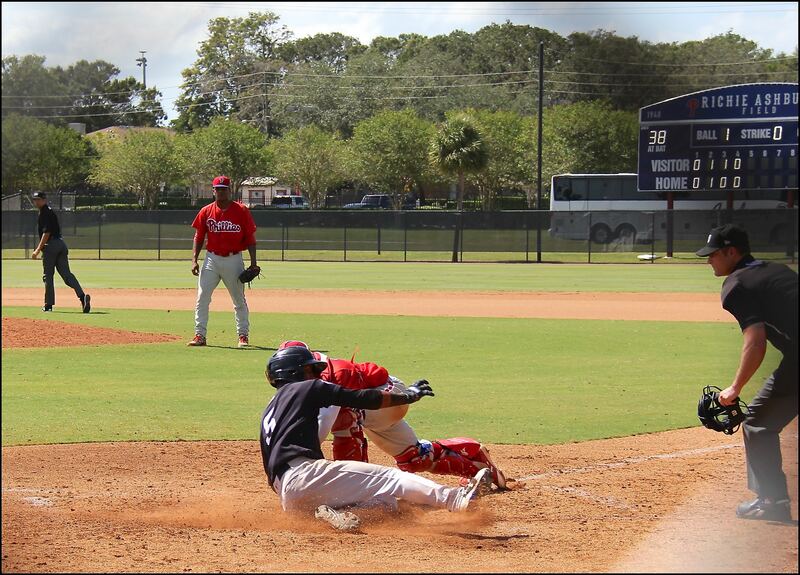 Mickey Moniak went 3-3 with a double. The Phillies won 3-1. Tuesday, the Yankees came to visit, and the start time was moved up. Most spectators arrived late. Mark Wylie got some photos. 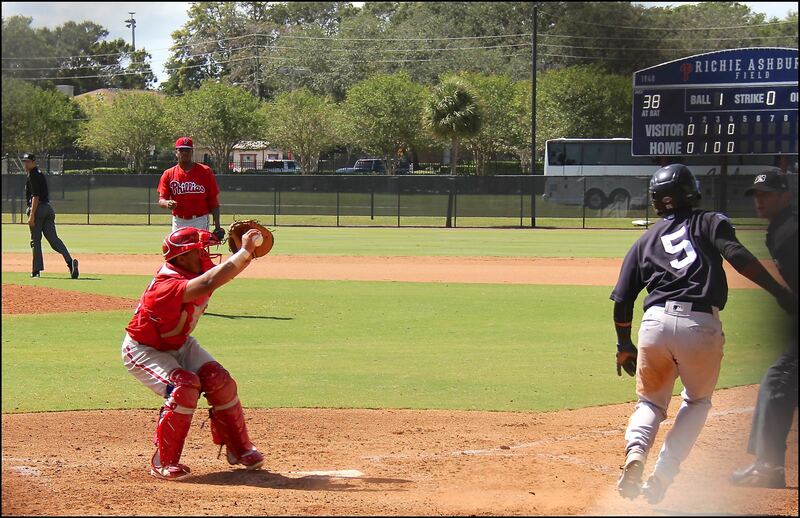 And this amazing sequence of photos that show the Phillies getting two outs on an attempted double steal. 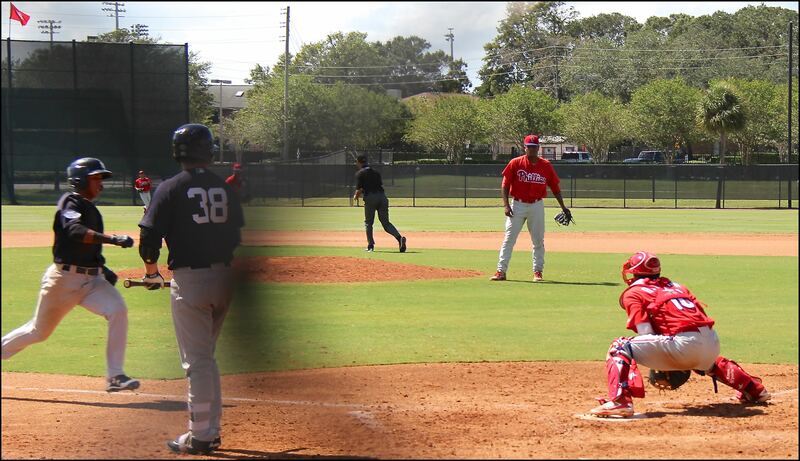 The players – Victor Sobil on the mound, Rodolfo Duran behind the plate, Arquimedes Gamboa playing second base. The scene – First and third, nobody out. ACTION! The out call came, two outs, nobody on. I think the final was Yankees 6-1. 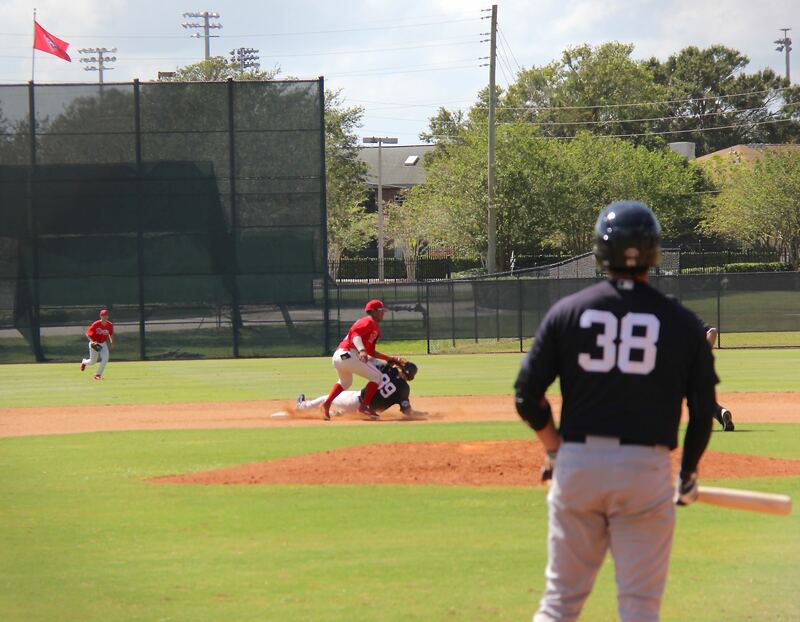 Wednesday, the intrasquad started early. When I got there before noon, they had already completed two innings. They only played four. 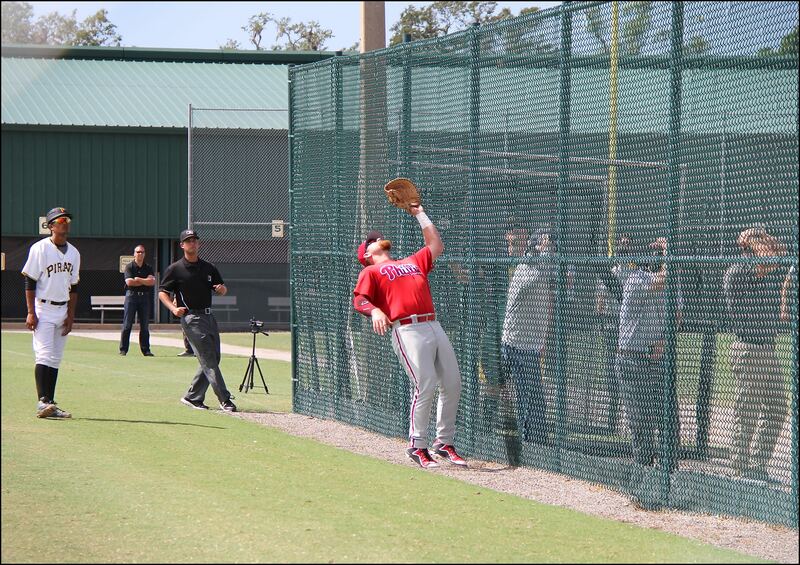 Thursday, Mark Wylie provided these highlights from Bradenton and more photos. 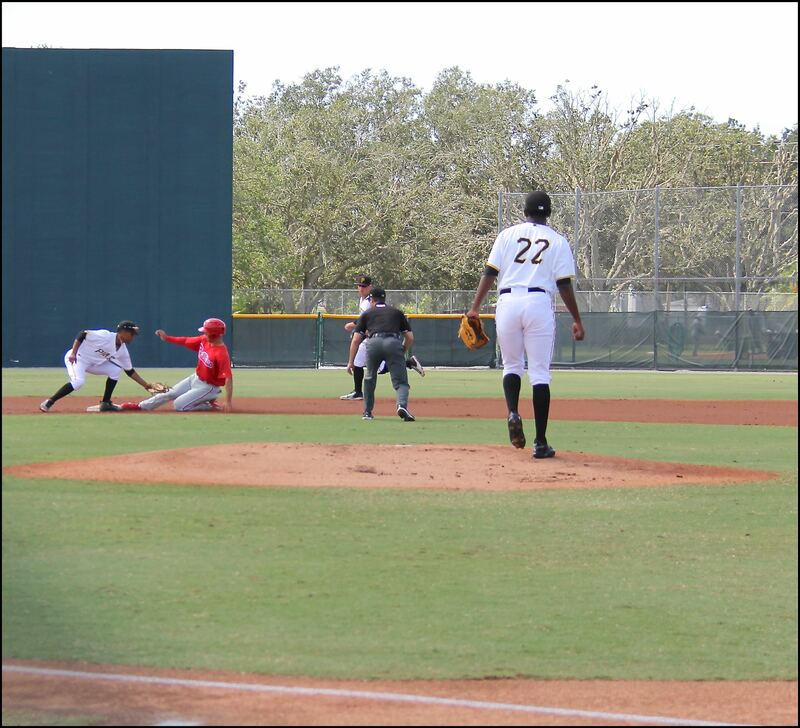 Hi Jim, Here are some highlights from Thursday’s FIL game at Pirate City in Bradenton against the Pirates. It was the last FIL game of the year for the Phillies. They definitely packed their hitting shoes for the game. 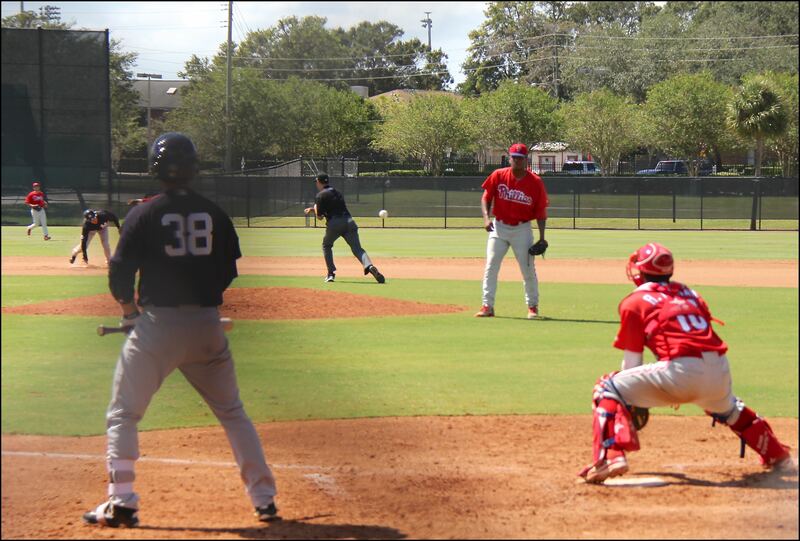 The Phillies brought along many of their DSL/International signees who hadn’t played in games in the States yet. 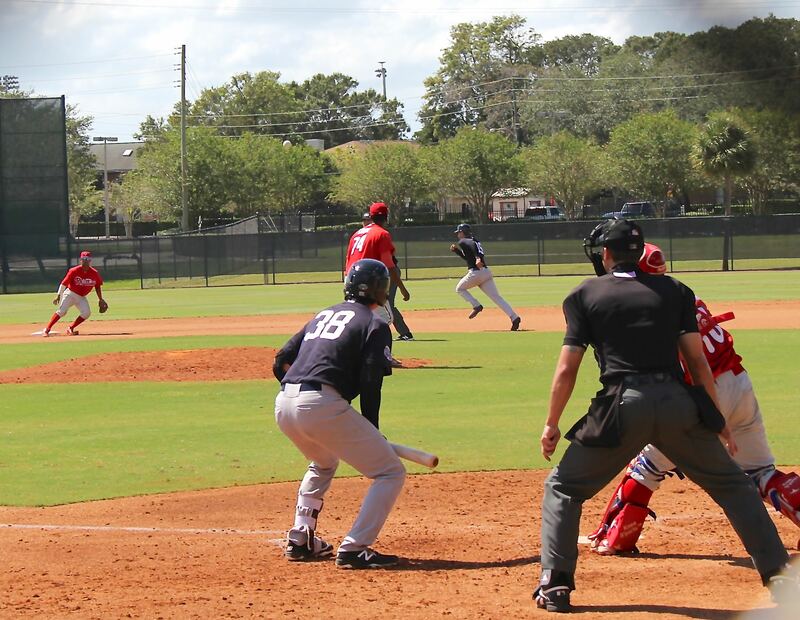 Most of the young players were pitchers, and they had impressive stuff. 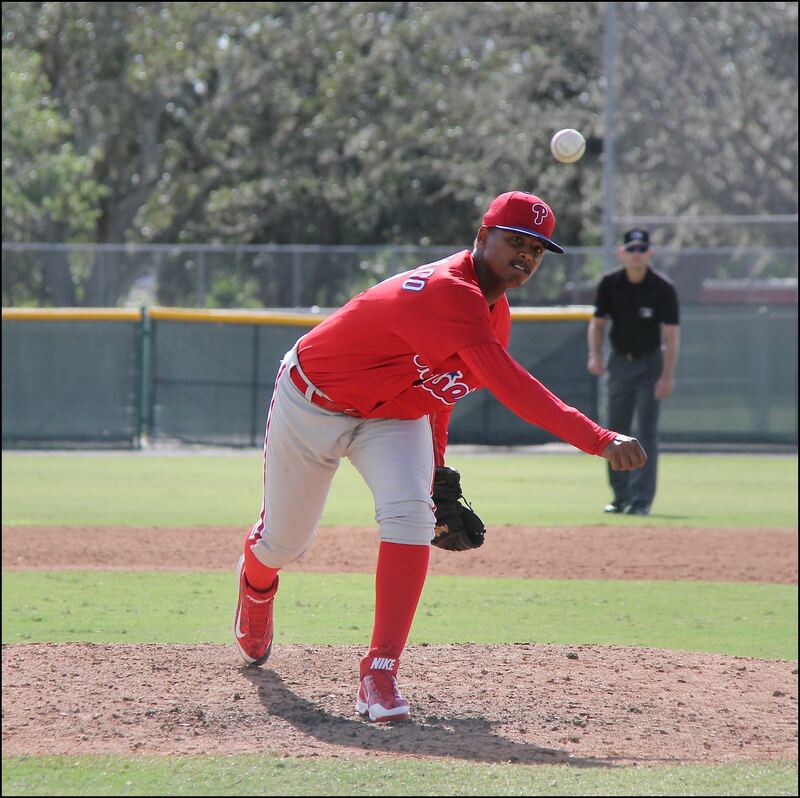 I will attach a separate e-mail with photos of the youngsters in action, in case you want to do a separate piece introducing them to your readers, giving them an idea who the young pitchers are. I am sure the pitchers names will pop up a lot in coming seasons. 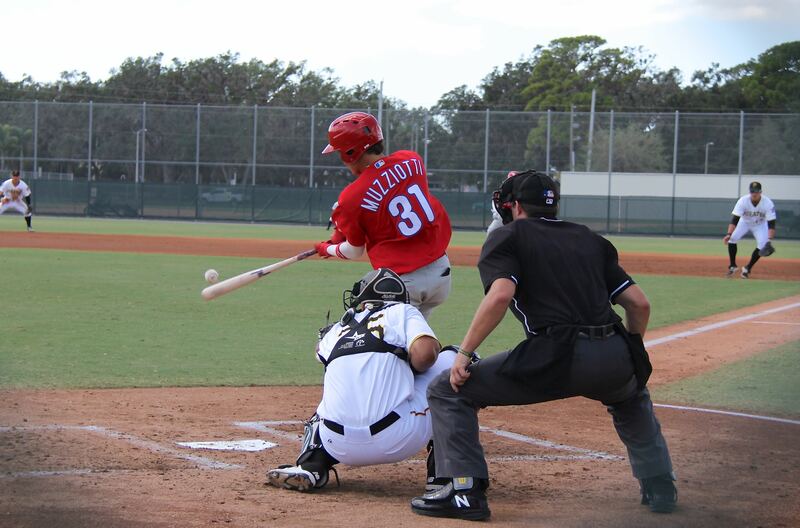 Anyhow, on with the write-up: Simon Muzziotti led off the Phillies first with a beautifully placed bunt, and easily beat it out. 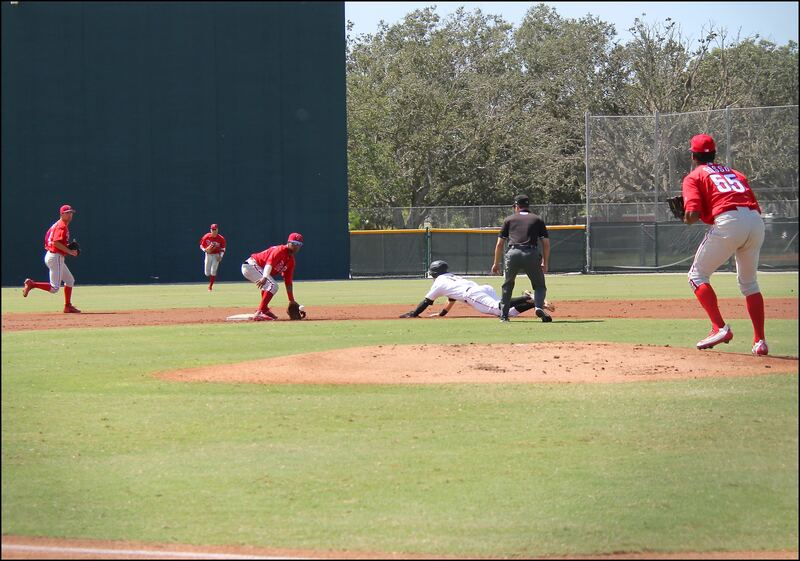 He then proceeded to steal second and easily beat the throw (photos attached). 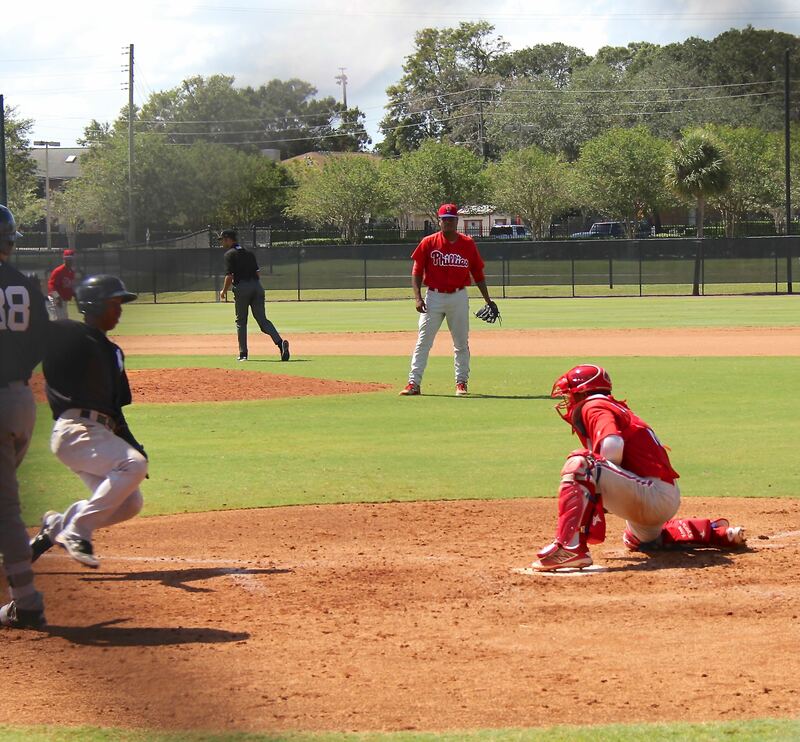 He moved to third on a long fly out by Jhailyn Ortiz, and came home on an RBI single by Yahir Gurrola (Photos attached). 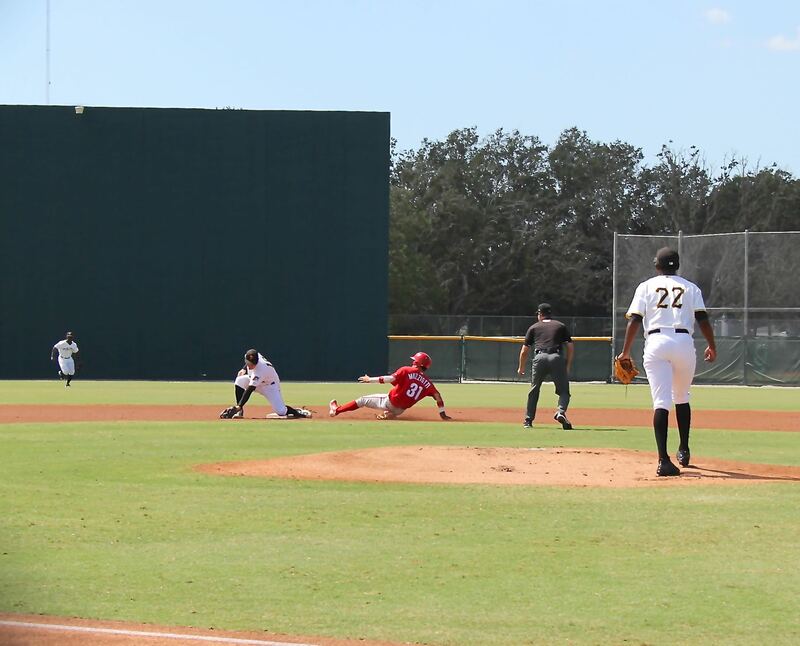 Gurrola also stole second in the inning, but was stranded there (photos attached). 1-0 Phillies after the top of the 1st. 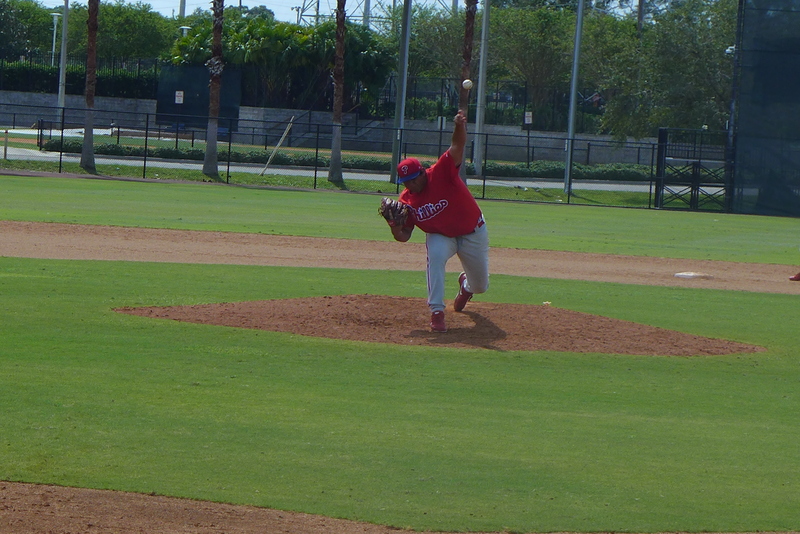 Ramon Rosso took the mound for the Phillies and pitched 3 shutout innings (Photo attached). He didn’t give up any hits and didn’t walk anyone, while striking out 2. He did hit the first Pittsburgh batter of the game squarely in the back. 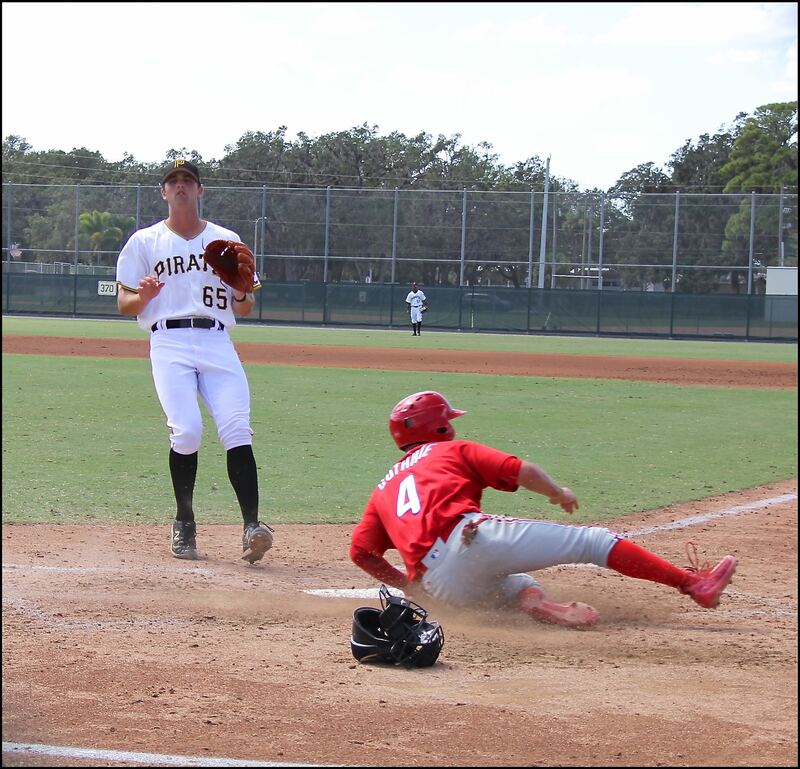 That batter was thrown out attempting to steal second base by catcher Kip Moore (Photos attached). Simon Muzziotti made a nice running catch in center field to end the bottom of the second. 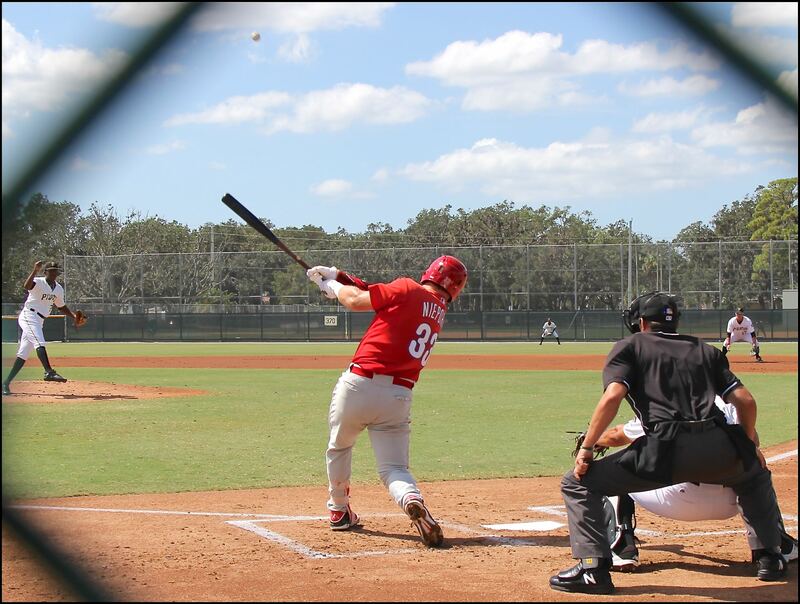 The Phillies scored two runs in the top of the second on Quincy Nieporte’s home run to center field (Photos attached) and an RBI single by Brayan Gonzalez. 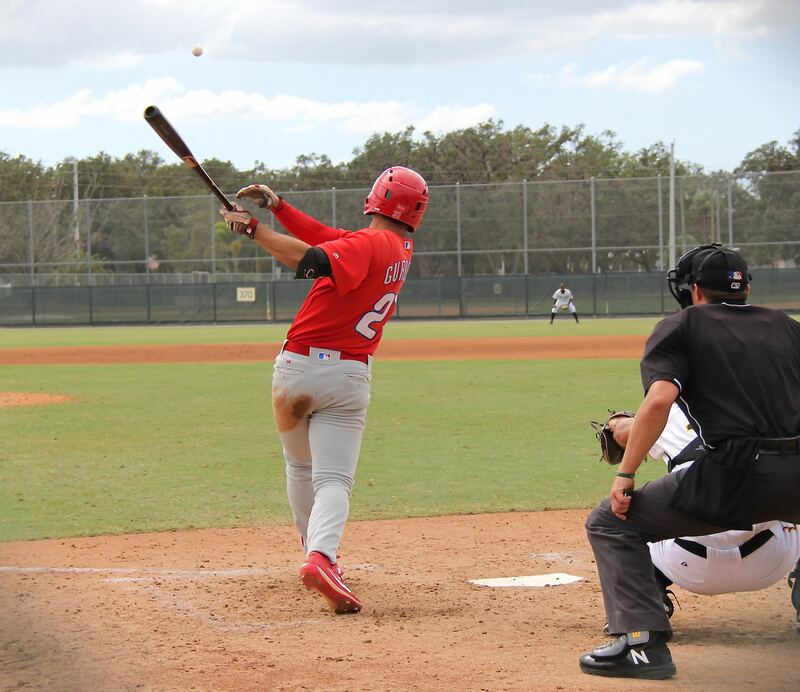 Colby Fitch and Simon Muzziotti also had singles in the inning. 3-0 Phillies. The Phillies scored three more runs in the top of the 3rd inning. All of the hits and runs in the inning came after there were two outs. Kip Moore, Jack Zoellner had singles, and Colby Fitch had a triple in the inning. The Phillies scored two more runs in the fourth inning. A Dalton Guthrie single to LF, walks to Jhailyn Ortiz and Yahir Gurrola, a Greg Pickett sac fly, a Quincy Nieporte HBP, and a Kip Moore RBI single to RF led to the two runs. 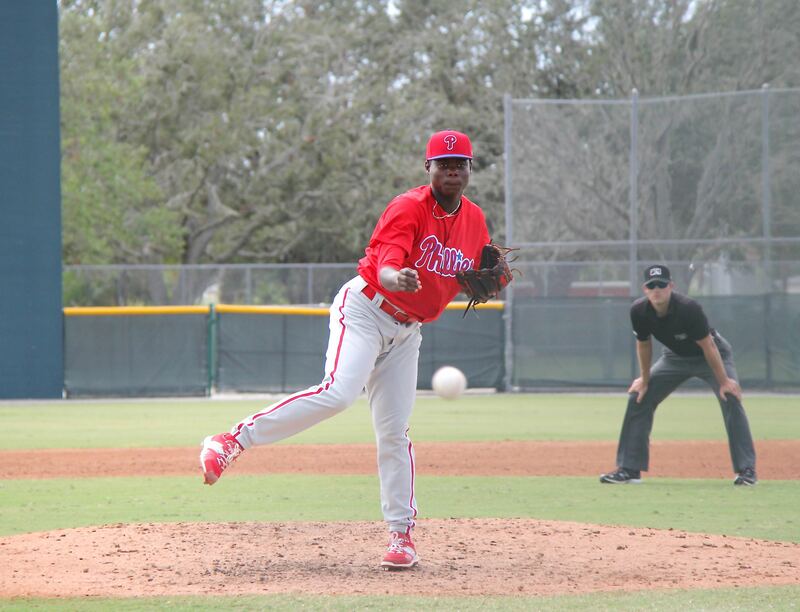 The Phillies brought in seventeen year-old international signee Alfonzo Puello to pitch the bottom of the fourth inning. Puello had just turned seventeen on Oct. 10. He throws hard. 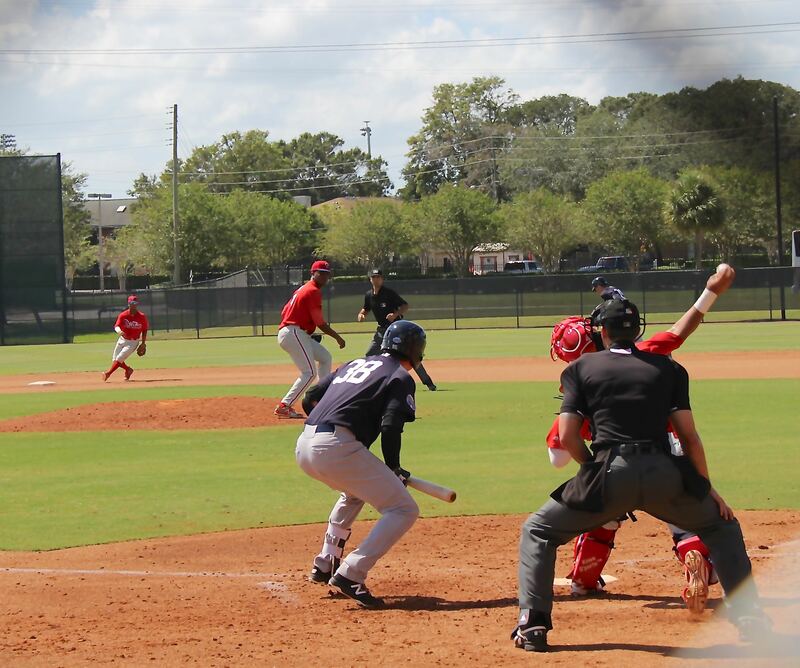 Puello quickly got a foul pop-up to first and a called third strike, before giving up a BB, a home run to CF, and a triple to right center field. He then settled down and got a pop-up to Brayan Gonzalez at second to end the inning. 8-2 Phillies after four. No Phillies’ scoring in the top of the fifth. 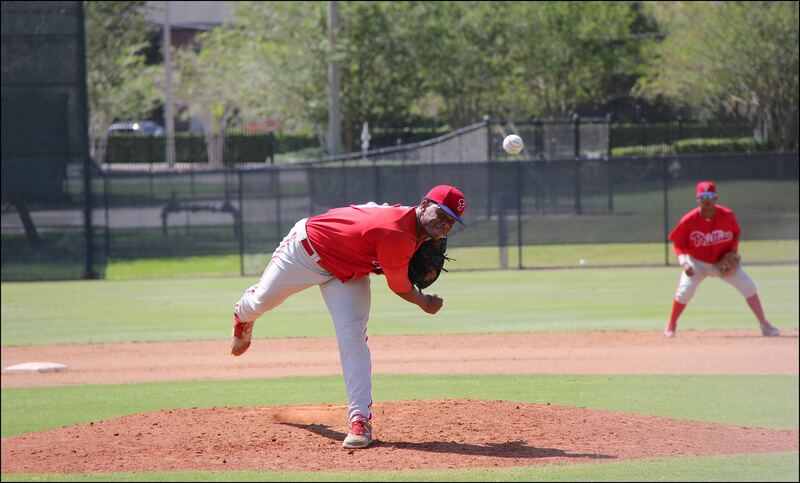 In the bottom of the fifth inning, the Phillies brought in Jonas De La Cruz to pitch. Jonas is a nineteen year-old from the DSL. 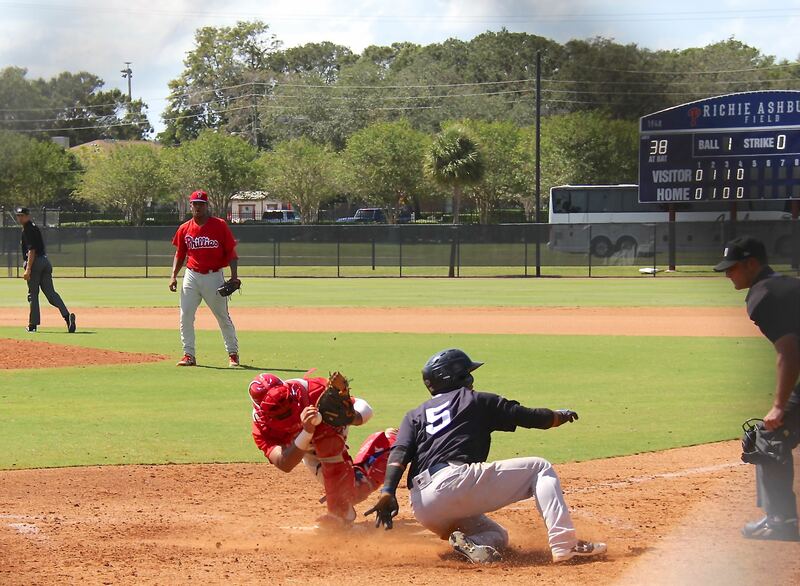 He quickly gave up two singles to LF, but then got a double play grounder and a 5-3 groundout to end the inning. Still 8-2 Phillies. The Phillies broke the game wide open in the sixth. 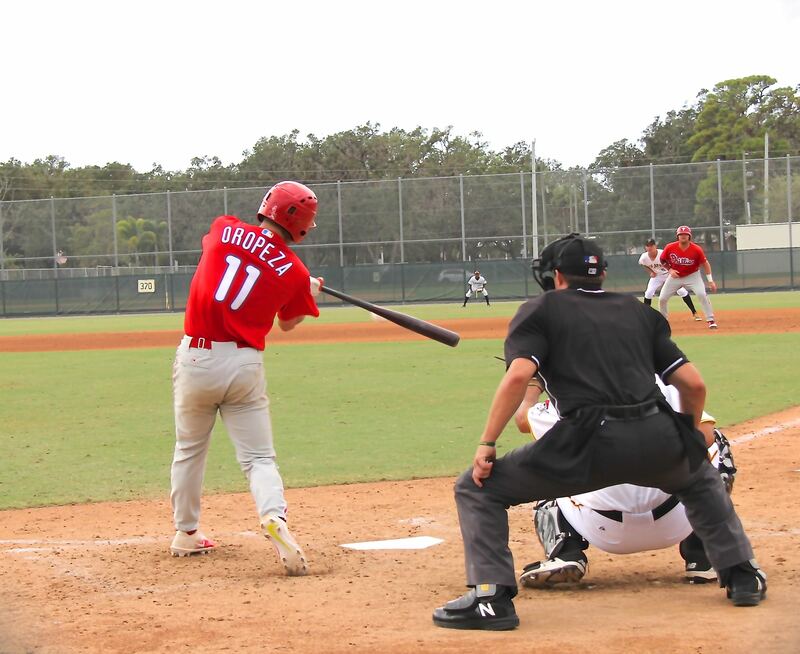 An error, a Jhailyn Ortiz RBI double to left center field, a Yahir Gurrola single to right center, a Quincy Nieporte BB, and a Carlos Oropeza (catcher) sac fly to the right field corner brought in three more runs. 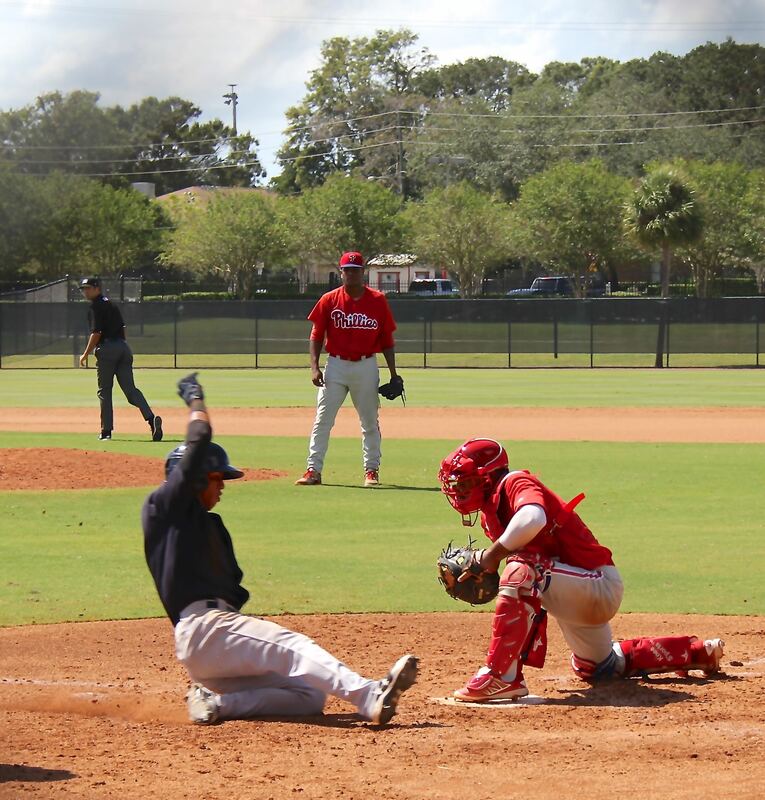 Rodolfo Duran (DH) also had a bloop single in the inning after the scoring ended. 12-2 Phillies. 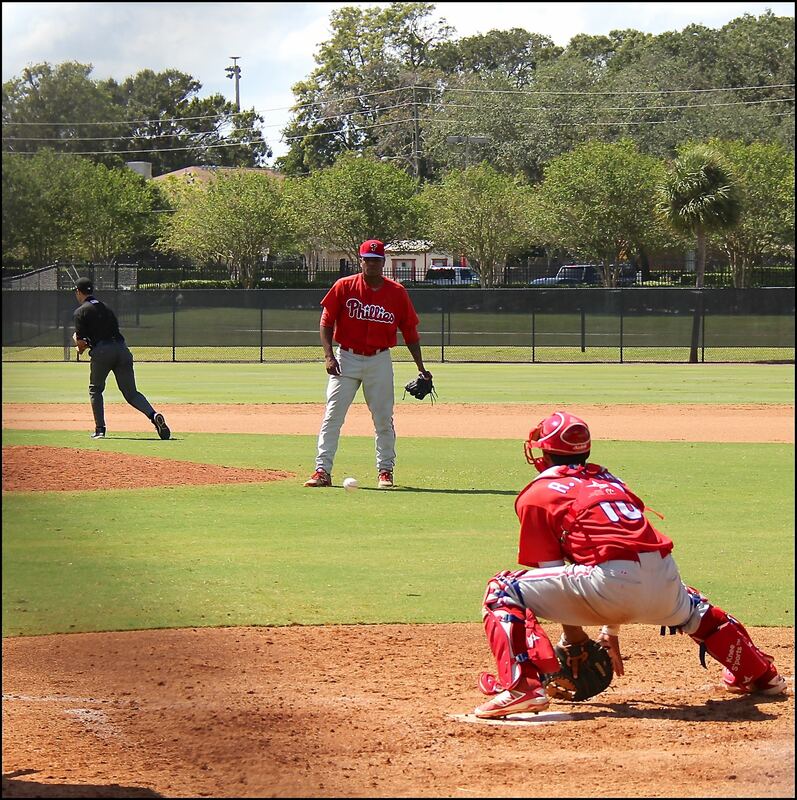 In the bottom of the sixth, the Phillies brought in Victor Vargas to pitch. Victor is a seventeen year-old (turned 17 on Sept. 3rd) international signee from Cartagena, Columbia. He looked good as he had a 1-2-3 inning with 2 strikeouts looking and a 4-3 groundout. Still 12-2 Phillies. The Phillies didn’t score any additional runs after the 6h inning. Julio Francisco did have a hard ground single to CF in the 7th, and Daniel Mayer had a line drive single to CF in the 7th. Quincy Nieporte had a line drive single to left-center field in the 8th. That was it for the offense in the game. The Pirates crept back into the game a bit in the bottom of the seventh inning. Ben Brown came on to pitch for the Phillies. He got roughed up a bit, but the Phillies left him in to pitch through it, and he persevered and got it done. None of the inning rolling stuff for the Phillies (not so subtle jab at the Blue Jays). It was a good learning opportunity/character builder. The Pirates’s first batter of the inning hit a single to RF. The next batter flied out to CF. A balk and BB put runners on first and second, and a single to LF brought a run in . Another single to LF loaded the bases. A bases loaded double to the left-center field fence brought in three more runs. A WP moved the runner over to third, where a sac fly brought him in with the fifth run of the inning. Brown then struck out the next batter swinging to end the inning. Rough inning but he worked through it and learned from it. 12-7 Phillies. 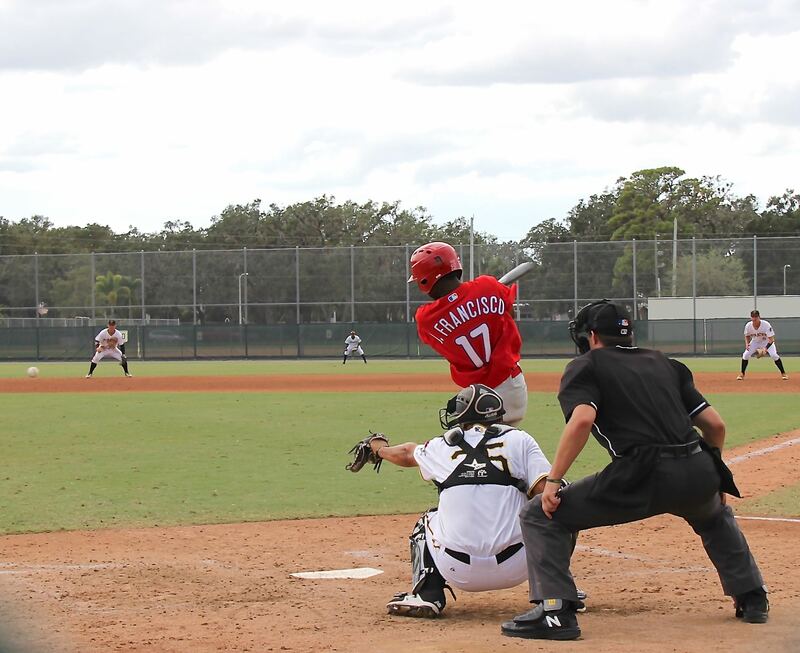 Carlos Francisco, a nineteen year-old from the DSL, pitched the bottom of the 8th inning for the Phillies. 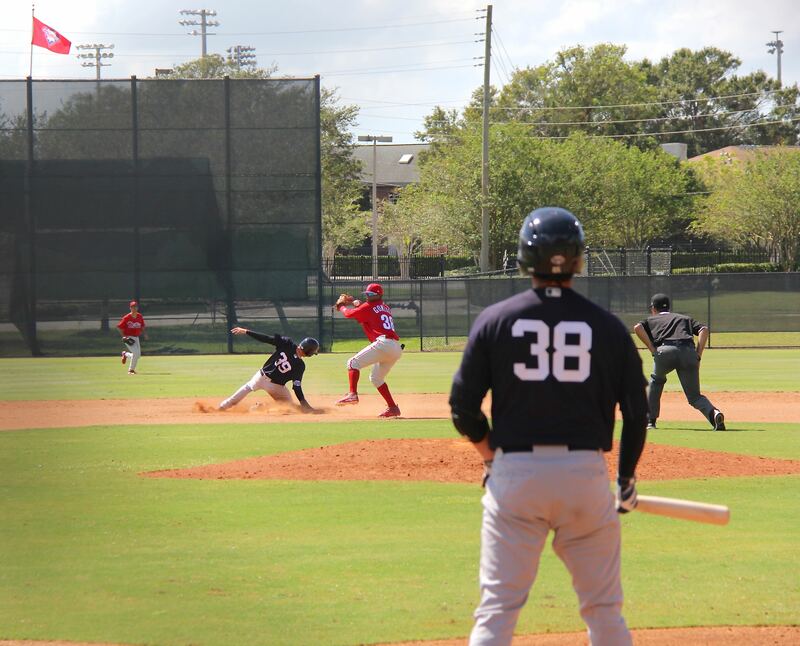 He walked the first batter and then induced a pop-up to the shortstop for the first out of the inning. The next batter grounded into a 5-4-3 double play started by Jacob Holmes at 3rd. 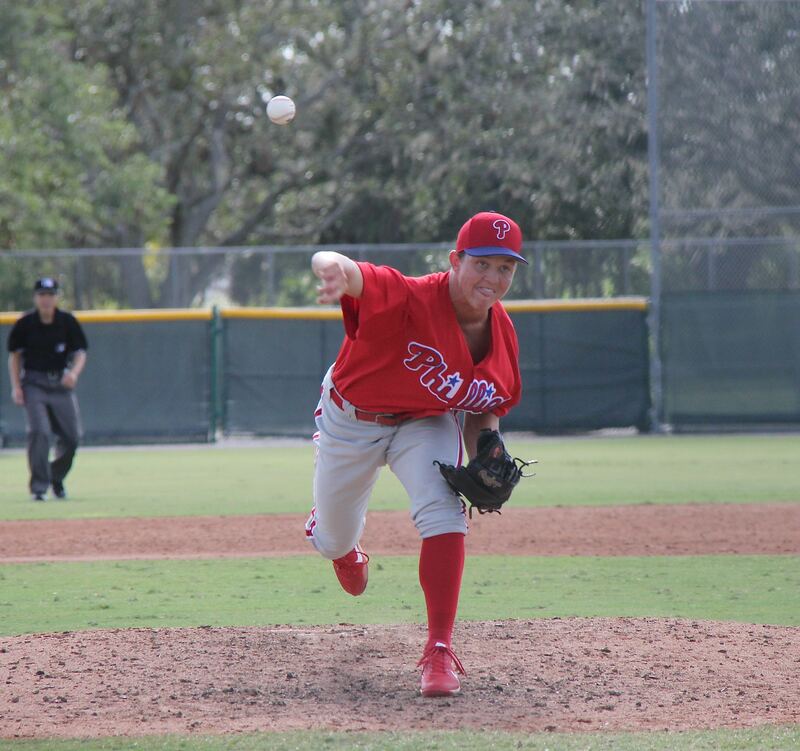 Seth McGarry pitched the bottom of the ninth for the Phillies. He quickly got two 5-3 groundouts for the first two outs of the inning. 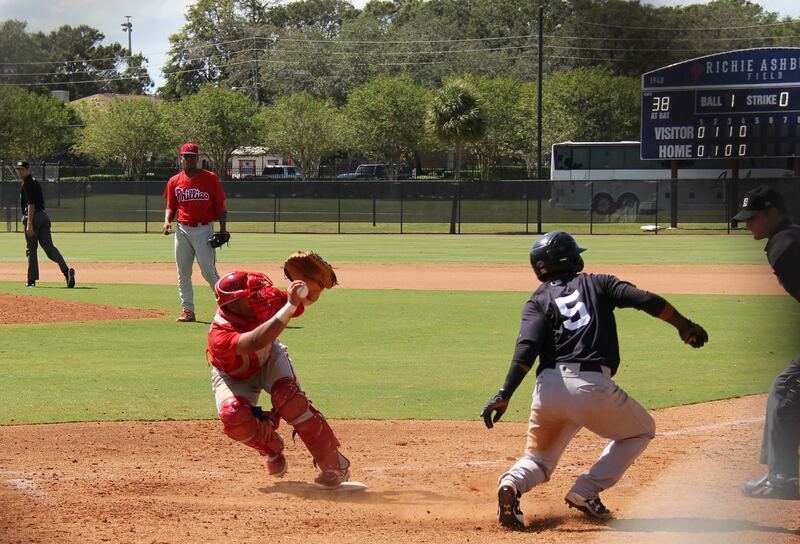 Jacob Holmes made a nice short-hop pick up and throw on the run for the second of the groundouts. McGarry then hit the next batter with a pitch, before ending the game with a fly ball out to center field. 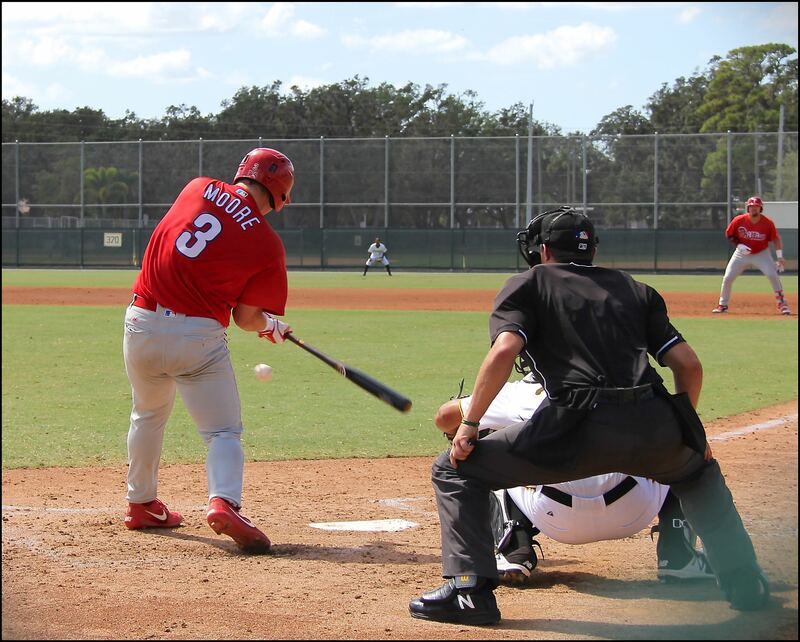 Lots of pitchers and position players were inserted into the lineup throughout the game by the Phillies. It was nice that they tried to get everyone some game action before they broke camp on Friday and headed home today. I am sad that game action is over for the year. The very short FIL schedule had some fun games to watch this year. Lots of new players to see for the first time. Lots of good talent on display. The future is looking bright. Thank you Mark for all the great photos you provided for the Phuture Phillies community. I know that I appreciate your allowing me to use them in articles. Jim … again, thank you for these thorough updates. I appreciate all of your (and Mark’s) hard work. Early in his career, Sid was a strikeout machine with the oddest and most effective uphill lefty delivery I have ever seen. I was still in NY that time and followed his starts religiously. If he had any sort of control, he would routinely strikeout 12 or 14 guys in 6 or 7 innings. He was almost unhittable. The most amazing thing is he threw an 87-89 MPH unhittable power fastball – it seems odd to say, but the ball exploded about 10 feet from the plate. I’ve never seen anything like it before or since. The other funny thing about Sid at that time is how much his weight fluctuated. He went from being sort of fat to average and back again and everything in between. I swear to God that one time he got fat BETWEEN STARTS. I’m serious – he might have gained 10 pounds from the first start to the next. Again, Sid was in his own category. I’ve never seen his like before or since. And, man, it was entertaining! I prefer El Supper. Or Pavarotti. How about Bigger Papi ? Dr. K-arnivore (in honor of the 76ers opener tonight). Jake the Cake could be a winner. 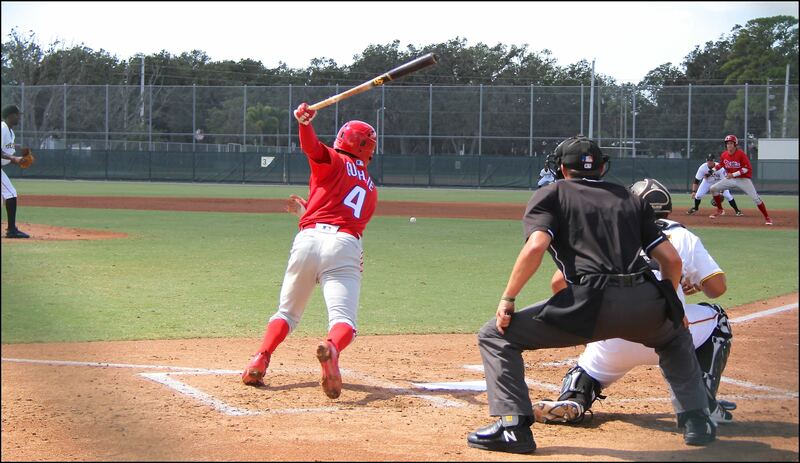 Phillies may have another diamond in the rough CFer with Simon Muzziotti. With Moniak slated for LKW to start 2018, Muzziotti may have to settle for EST then onto Williamsport. rocco…..that would be fine, but at Lakewood Ortiz will need ABs also as the RFer…along with your boy Stephen and then there are Matos and Luis and then Moniak for CF. 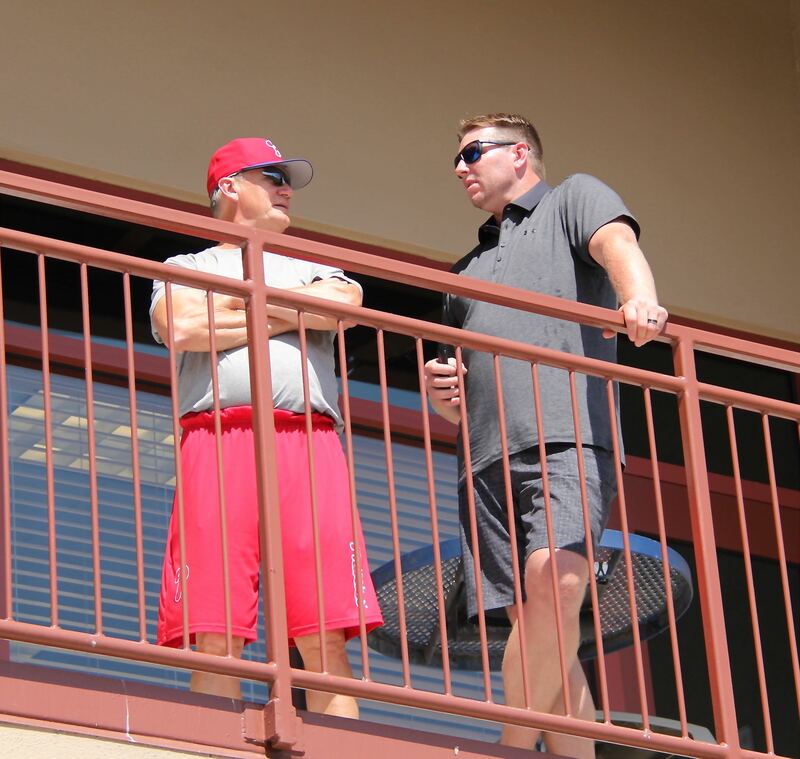 Clearwater…assume Pujols is there in RF again, so there are Haseley in CF, Listi and maybe even Martinelli…plus also not sure he will be able to handle high-A pitching right now. 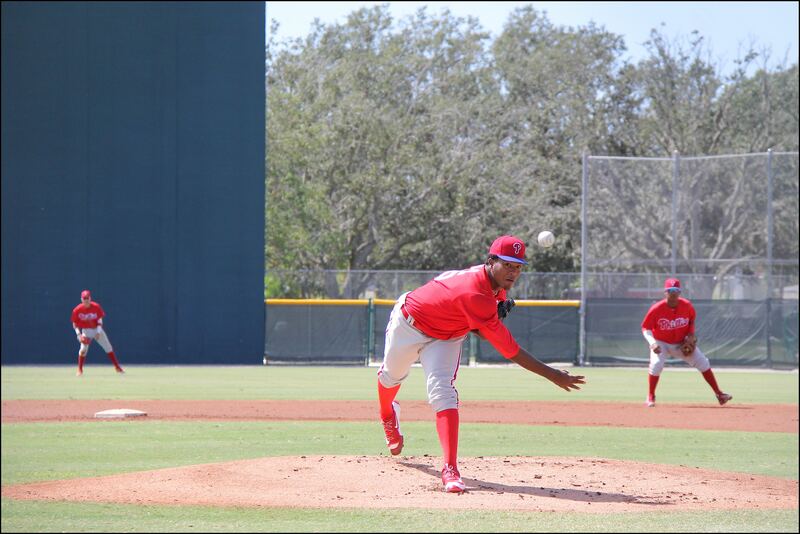 Good to see Sixto working on his off-speed pitches. Lots of good lefties on the mound. His weight seems to help Hernandez. He can certainly pitch. Last year’s draft provided many good players. The system looks good long-term. Puddinhead–I just made the connection that your name is an homage to the great Willie Jones. Didn’t know Puddinhead was his nickname until I saw his plaque at the Phillies Wall of Fame. @hinkie – yeah, jakob hernandez. he will probably go up faster as lefty RP but it will be interesting to see if the Phils will stretch him out as a starter. 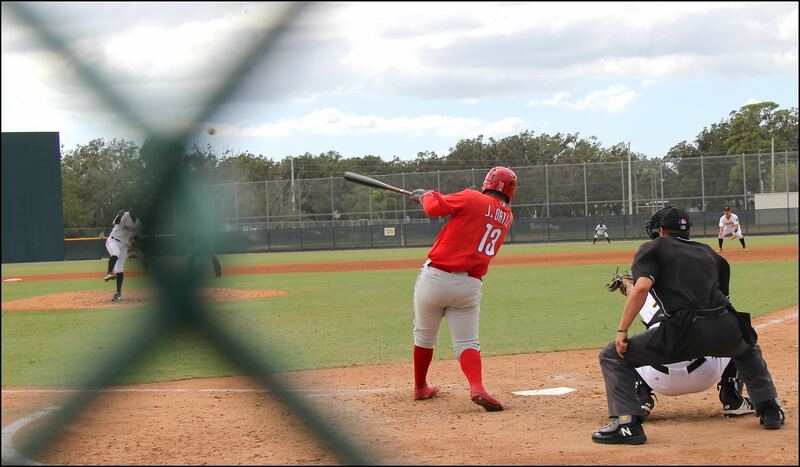 Luis Gohara is big, but it looks like Jakob Hernandez is bigger! Leonel Aponte – after 2 good years in DSL, looks like he will be going stateside. I’ll keep an eye on him. 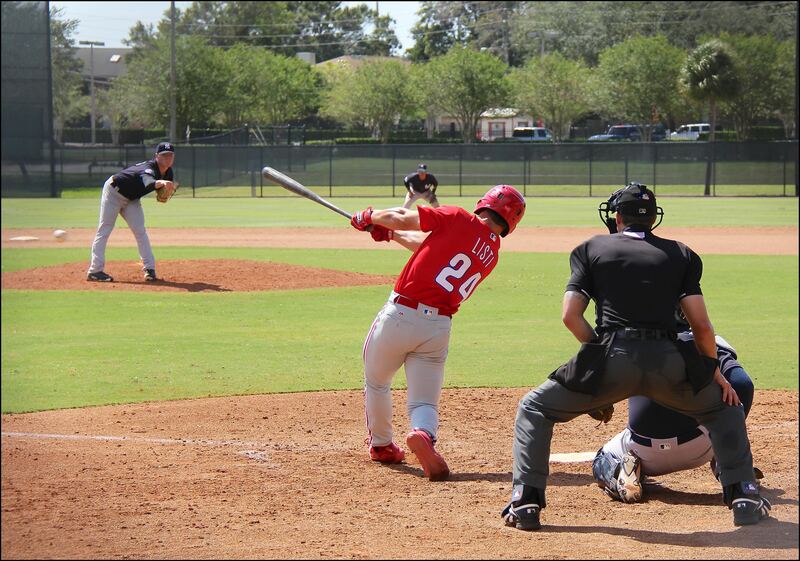 Kyle Young looks like he could reach across the plate and drop the ball into the catcher’s mitt. Dude’s seriously long.